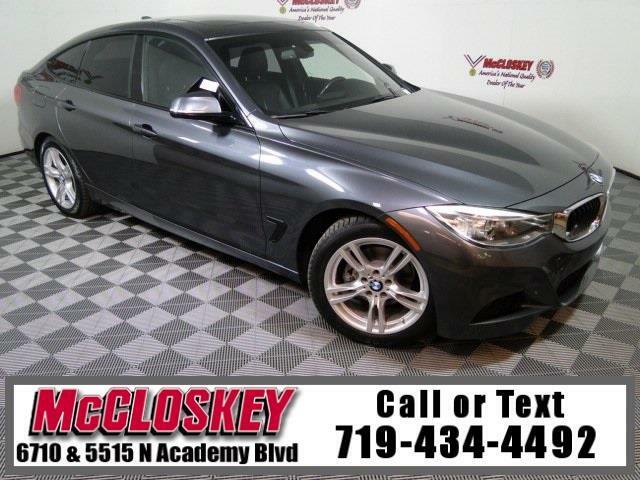 Pamper yourself in this 2015 BMW 328i XDrive Gran Turismo All Wheel Drive with Navigation System, Harmon Kardon Sound System, Heated Leather Seats, and Turbocharged Engine! The 328i xDrive Gran Turismo hatchback comes standard with 17-inch alloy wheels, automatic headlights, foglights, automatic wipers, power-folding and auto-dimming mirrors, a panoramic sunroof, power liftgate, cruise control, dual-zone automatic climate control, eight-way power front seats, driver memory functions, a leather-wrapped tilt-and-telescoping steering wheel, a 40/20/40-split-folding rear seat and an auto-dimming rearview mirror. Standard electronic features include Bluetooth phone and streaming audio connectivity, the iDrive electronics interface, a 6.5-inch display and a nine-speaker sound system with a CD player, HD radio, an auxiliary audio jack and an iPod/USB audio interface. This vehicle passed our 110 multi-point inspection and is backed by our National Quality Dealer of the Year Award. We are an ''A+'' Better Business Bureau Rated Business. We offer low interest rate financing, low down payments and the highest trade allowances in the state! Here at McCloskey we do things a bit differently, we shop our competition every day to ensure a great value to you. Come on down and experience it for yourself. This McCloskey Assured vehicle includes a 2 month/2000 mile Warranty and a Vehicle History Report!! At McCloskey we strive to provide ASSURANCE, TRUST, VALUE AND QUALITY! Call 719-434-4492.